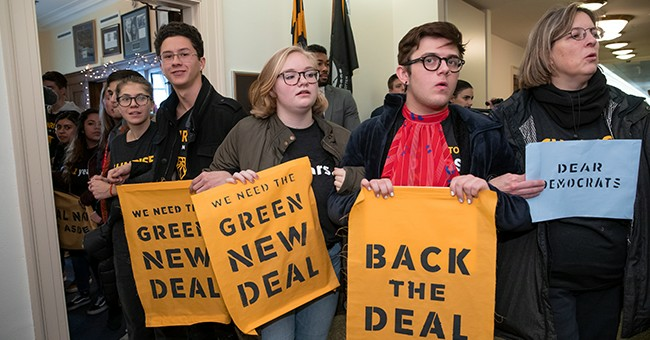 The so-called Green New Deal is a vacuous, fuzzy emanation from the mushy, delusional minds of radical left ideologues. It is something that does not even deserve serious consideration, yet there seem to be a lot of people who are seriously considering it, so lets take a look. H. Res. 109 is the resolution to the House of Representatives that puts the Green New Deal on the map. The main idea behind it is that it will mimic the amazing results of the original New Deal of F. D. R. in the 1930s. According to the legend, that New Deal, along with the Second World War did amazing things for the economy, putting millions of people to work. It is, indeed, only a legend. The first New Deal was a response to the terrible consequences the Great Depression. When it started in 1929, it was just a typical depression. The 1920 depression, for comparison, the one you never hear about, was deeper and caused higher unemployment and a more radical drop in productivity. The response of the federal government was the same as in prior depressions: Cut spending, cut taxes, and cut debt. Within eighteen months, the economy was getting back to normal. The government response to the 1929 depression was different. Herbert Hoover, the professional engineer, treated the economy as a machine and tried to engineer a recovery. The result was that it got worse. People can argue about which government manipulations, regulatory, banking, or fiscal, caused the further decline, but nobody can say that the government was complacent. Roosevelt’s New Deal responded to the perverted results of political and monetary manipulations with even more interventions and programs, lots of programs. It is true that such programs employed millions of people at that time, but it is likely that those programs, as well as the radical economic manipulations, prolonged the depression and double-digit unemployment for ten extra years. It didn’t cure the ills. That WWII was a boon for the American people is also a silly fantasy. Gross national product soared at that time, but that just shows what a useless measurement it is. Though nationalistic pride enabled people to put up with the difficulties, the shortages of almost all goods, the rationing, prosecutions for “hoarding,” and so on, were not a sign of prosperity. The American people suffered, unless of course they were involved in the military effort in some way. It was not a good time for normal, Main-Street Americans. The Green New Deal holds that America is facing a disaster similar to the War and the Great Depression, in that carbon dioxide produced by human activities is going to bring about sure destruction of untold proportions. It is actually an invention of British leftist radicals, with the Green New Deal Group initiated in 2007. It is supported by the fuzzy, progressive/socialist economics of the New Economics Foundation. These people are pretty organized and have been working on this for a long time. The very foundation is, however, the unsound, unhistorical idea that climate change is: 1. caused primarily by CO2 produced by human activities, 2. increased CO2 is bad, 3. disaster is impending if we don’t give green central planners their way, 4. central planners know what to do, and 5. Central planners are not self-interested, corrupt, or ignorant busybodies, all of which are not true.